Organic, unfiltered, and cold pressed. Produced on our own lands in the mountains of Crete. The beautiful 750ML bottle! 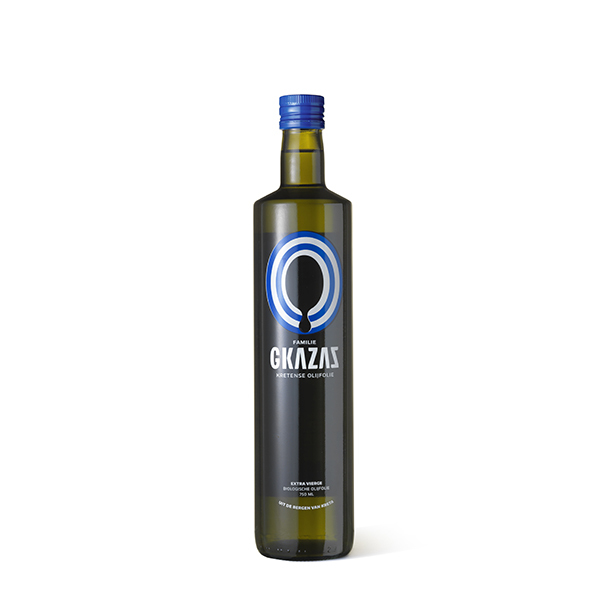 Gkazas extra virgin olive oil is free from additives and not mixed with other oils. Furthermore, it is unfiltered, organic and cold-pressed. A 100% natural product! Order before 23:45 for next-day delivery (Netherlands and Belgium)! The jack of all trades! This mighty bottle is one for the enthusiast who truly knows himself and understands how richly he wants to let the oil flow. From hobby-chefs to professionals, food bloggers, and large-scale consumers: they all know what to do with this bottle. We go to all lengths to ensure an honest family product. Our extra virgin olive oil is produced on our own lands in Crete. The harvesting and pressing is done with our own hands, the most authentic way possible. Only this way we can guarantee the highest quality Greek olive oil. Whilst we are very busy knocking the olives out of the Cretan trees, this 750 ML bottle is blown to life in Eastern Europe. Did you know that, after a couple of months of self-filtering, our extra virgin olive oil is transported to the Netherlands where the bottles are now ready and waiting to be filled up? You can return our product within 30 days if you aren’t 100% satisfied with for the full product costs. All the to be returned products should be sent over in their original state.